Commander Dring retired from the U.S. Naval Reserve after 27 years of active and reserve duty service on board destroyers and frigates, as well as reserve duty in a number of assignments including composite Navy/Coast Guard coastal warfare/harbor defense units on the U.S East Coast, and an Atlantic Fleet carrier battle-group staff augmentation unit. He is the co-author, with William D. Wilkinson, of a book published in 2009 by the University Press of Florida, American Coastal Rescue Craft, on the technical design history of all the coastal rescue lifeboats and surfboats ever used by the U.S. Coast Guard and its predecessor service, the U.S. Life Saving Service. This book won the best history book award from the Foundation for Coast Guard History in 2010. Commander Dring is on the board of directors of the U.S. Life-Saving Service Heritage Association (the historical society for the U.S. Life-Saving Service, and its mission continuation in today’s U.S. Coast Guard), and on the board of trustees for the Twin Lights Historical Society (the historical preservation group for the former Navesink Twin Lighthouses in Highlands, NJ). He is a regular author-contributor to the Heritage Association’s quarterly journal Wreck & Rescue on the topic of coastal rescue craft. 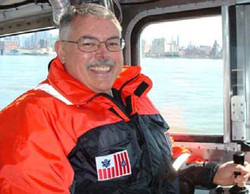 In 2010, he was given the U.S. Coast Guard’s Meritorious Public Service Award for his years of volunteer assistance to the Coast Guard in researching, preserving, and teaching the history of rescue craft, and their use by the U.S. Coast Guard and U.S. Life Saving Service. Commander Dring in civilian life is a pharmaceutical scientist, currently with Johnson&Johnson. He is married to the former Leslie Burkle, has two children, and resides in New Jersey.